They survived on merely spring water and the fruits from the carob tree that grew at the entrance to the cave. To ensure their clothes would not wither away during so many years of hiding, they buried themselves in sand up to their necks. Their commitment to Jewish life was unabated; they continued to pray and study holy texts every day. 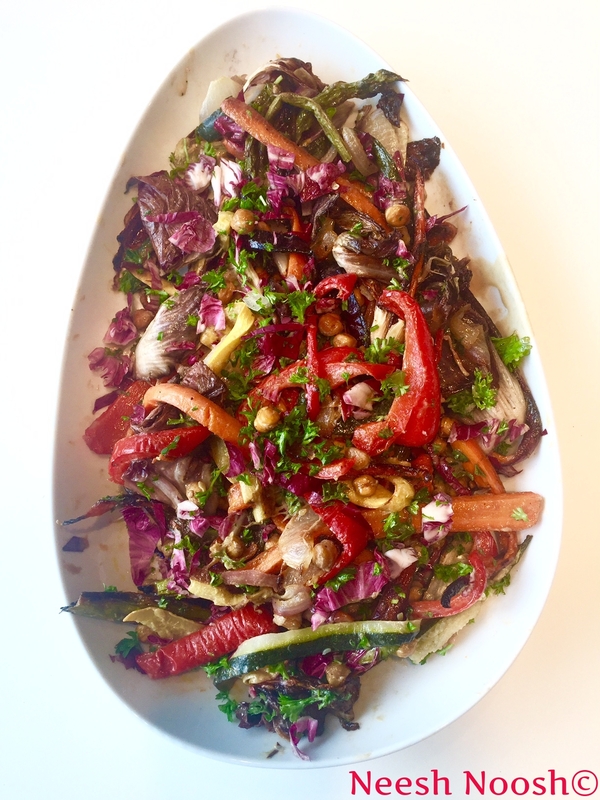 The bonfires held on Lag b’Omer “commemorate the immense light that Rabbi Shimon bar Yochai introduced into the world via his mystical teachings.” The dish I made is comprised of roasted vegetables, following the tradition of eating food cooked over fires on the holiday. The spicy ingredients (lemon, chilli and radicchio) are an extension of the fire theme. The tiny bit of carob powder is a nod to the carob that was eaten by Rabbi Shimon Bar-Yochai and his son. If you don’t have access to cooking over a fire, then simply roast in the oven. 1.Cut the radicchio in ½, reserve one half and cut the remaining piece into thirds—it might start to fall apart, which is fine. Keep the asparagus whole but remove the bottoms where they naturally snap off. Rinse the chickpeas and dry them as well as possible. 2. Place the prepared vegetables on parchment paper-lined baking sheets or roasting pans and drizzle with olive oil, salt and pepper. Roast at 400F for approximately 25 mins, until lightly browned. 3. The vegetables will not all cook at the same rate, so check on them as they are in the oven and remove as needed when ready (the radicchio will brown quicker). If you have access to cooking over a fire, then place them directly on the grill or skewers and cook until lightly browned over a small flame. 4. In a separate pan, add the chickpeas and toss with olive oil, salt and pepper or alternatively toast the chickpeas in the oven. 5. While the vegetables and chickpeas are roasting, chop the remaining ½ radicchio. 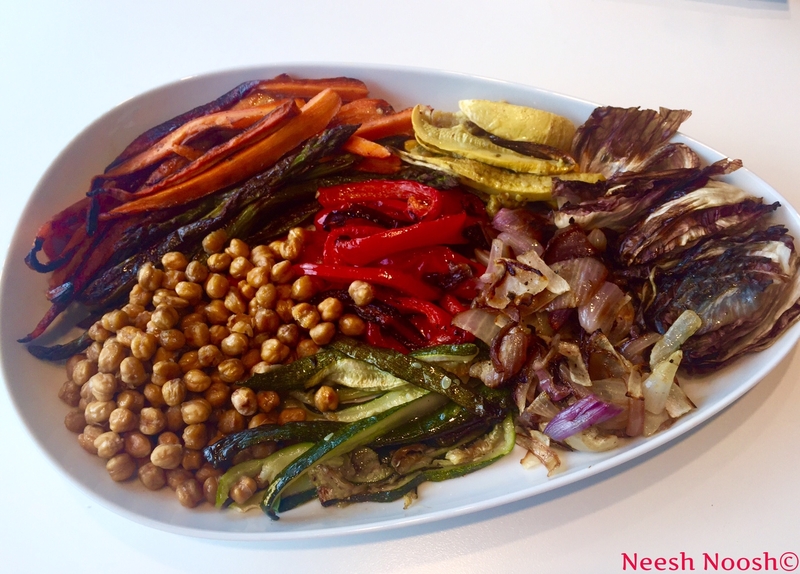 When they’re all done, remove the vegetables and chickpeas from the heat and place on a platter. Arrange by types of vegetables or toss together. Drizzle lightly with olive oil. 6. 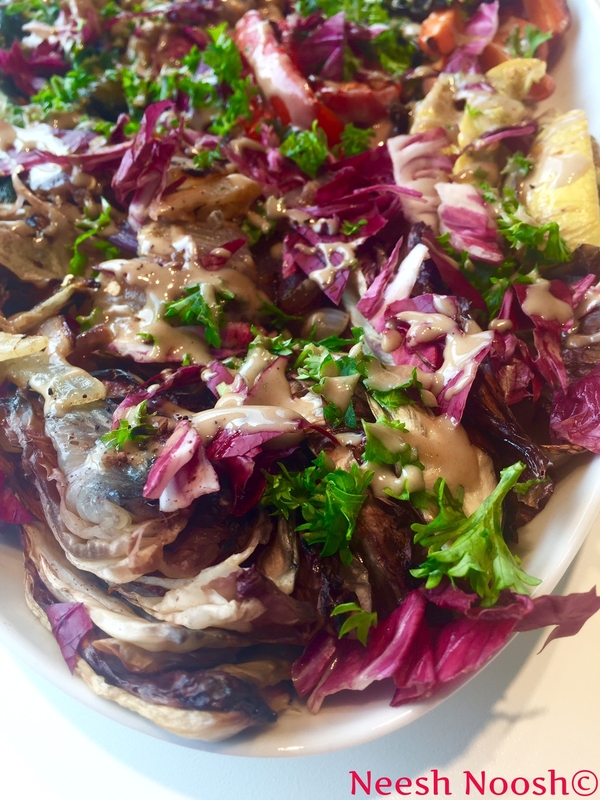 Sprinkle over the lemon juice, chilies, parsley and chopped radicchio, then generously drizzle the tahini over the vegetables. Finally, take a tiny pinch of carob powder and sprinkle lightly over the dish. If you’re serving the vegetables together, toss again with the dressing. This entry was posted in Entree, Holiday, Lag b'Omer, Side dish, vegetable and tagged cooking, fire, food, Jewish, Lag b'Omer, Rabbi Shimon Bar Yochai, recipe by Sarah Newman. Bookmark the permalink. As always your blog is interesting and your recepy tasty. Thank you.